Chris Judd signed, framed guersney from the Richard Pratt Cup match in Round 3, 2012. 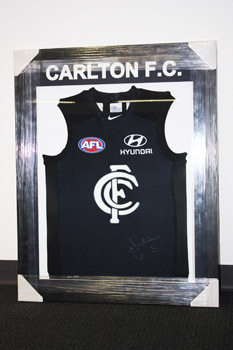 Chris Judd wore this number 5 Carlton guernsey in the Round 3 match at the MCG against Collingwood in the Richard Pratt Cup. The guernsey features the Richard Pratt Cup logo unique to the Carlton guersnseys made for this match and has been signed by Chris on the front of the guernsey. Guernsey has been framed and is ready for display in your home or office.